BLOGGAROO?!?! 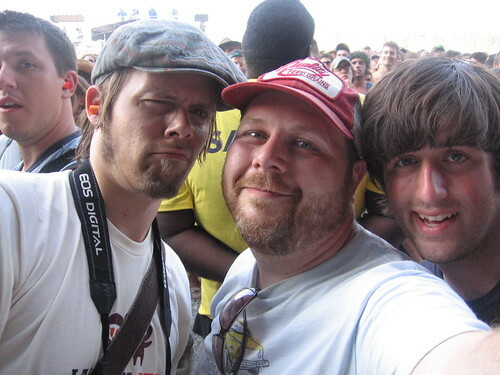 I Am Surrounded By Bloggers At Bonnaroo!!! It’s always wonderful to see my fellow bloggers at any music conference or festival, and I saw a bunch of you at Bonnaroo this year! Here’s a big hug to Ryan from Muzzle of Bees, Scott and Amrit from Stereogum, Matt from You Aint No Picasso, and Joe from Each Note Secure/WOXY. Even old friends like John Roderick from The Long Winters were out blogging the fest for MSNBC. Hanging out with you guys was awesome. Be sure and check out their sites for more coverage of the ‘Roo — if you’re a blogger who was there and I didn’t mention you, it’s because I didn’t get to meet you. Maybe next year?